Refresh an outdated kitchen with a complete remodel, offering a space for even the amateur cook to strive for professional chef status. When you partner with ProSource® of Vero Beach, you can create a phenomenal kitchen where your dollar goes further with our wholesale prices. 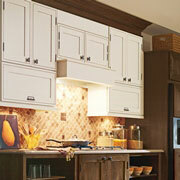 Influence a whole new feel in the kitchen with cabinets. This single upgrade not only adds storage, but charisma to the cooking area. Find different finishes, glazes, and paint colors, and customize the cabinets by wood type, door shape and overlay, and brand. 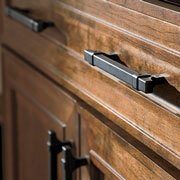 Cabinet hardware completes the cabinet remodel with functionality and style. Express personal style with cabinet hardware that comes in a sleek black or shiny gold (among many others), different types for all abilities to open, and various sizes to create a chunky or slim look. For countertops in a kitchen remodel, granite is currently winning in the most popular material contest, but we also have an immense selection of quartz and mixed-material countertops. Kitchen sinks are sometimes an afterthought because, after becoming consumed with the aesthetics, it’s easy to forget about flow and functionality. 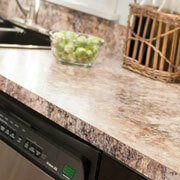 Choosing the right kitchen sink can make daily life in the client’s kitchen less stressful. After all, food prep and dishes are done in this space. If considerations include regularly entertaining guests or having a small army to feed, a double- or triple basin kitchen sink may be exactly what you need. 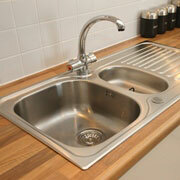 Or, if you don’t need a sink so large, a single-basin sink is always classic and charming. 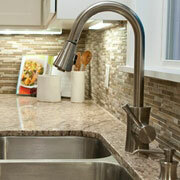 It’s reached for with each trip to the sink, so kitchen faucets play an integral role in kitchen remodeling projects. Yet they also serve as a statement piece of the kitchen’s personality. Select from a bevy of kitchen sink faucet materials, colors and styles that achieve the your vision.